Staymaker is the first book by indie author Andy Millen, and is something of a departure for my reading pile for, while it is in the strictest sense a historical novel, it is much more ‘gangland’ than ‘blitzkrieg’. The novel revolves around the smuggling rackets of the mid 18th century – a time when the government duty on good such as rum and tea and bans on export of wool along with compulsory sales systems were making the poor poorer. Thus rose groups, gangs and families who were by the letter of the law criminals, yet considered themselves ‘free traders’ and were often hailed as something of a dark hero by local residents and the folk they supplied at vastly improved rates. And therein lies something of what drew me to it. This is not a straight tale of bad guys and good guys. Every man in Staymaker is a shade of grey (though some are darker than others.) The tale and the action that unfolds within will evoke memories of old movies, series and books that you have probably forgotten. Moonfleet. Poldark. Jamaica Inn. Even Treasure Island and kidnapped. That certain era of history. And it really does evoke it. It is a well-written, well-characterised and well-plotted novel that brings us the story of a gang and its leaders who bear in many ways a resemblance to the Krays of the mid 60s in East London. Yes they were dangerous and even murderous men. But to the folk who lived around them, there was a certain respect (speaking as a man who has family who lived around them) for the levels of control they kept which prevented random crimes from afflicting the common folk. I feel certain that you will experience the time and the location through the telling of the tale, and certain scenes are so nicely put together that they are almost cinematic. The one negative point I must raise for a fair review is that the proofing of the book is a little lacking and would benefit from a solid edit (an issue that is a common hiccup with the indie writers and of which I myself have fallen afoul before now.) Typos, incorrect words occasionally and regular misplacings of speech marks were notable and for that I dropped the book from a 5 star to a 4 star rating. But I feel sure that with the next release that extra star will not be found wanting – as with other indie writers clearing up edits and rereleasing is a simple thing and I expect Millen will release a version 1.1 in the near future. And it is nothing but a hiccup in the scheme. So that’s my thing. 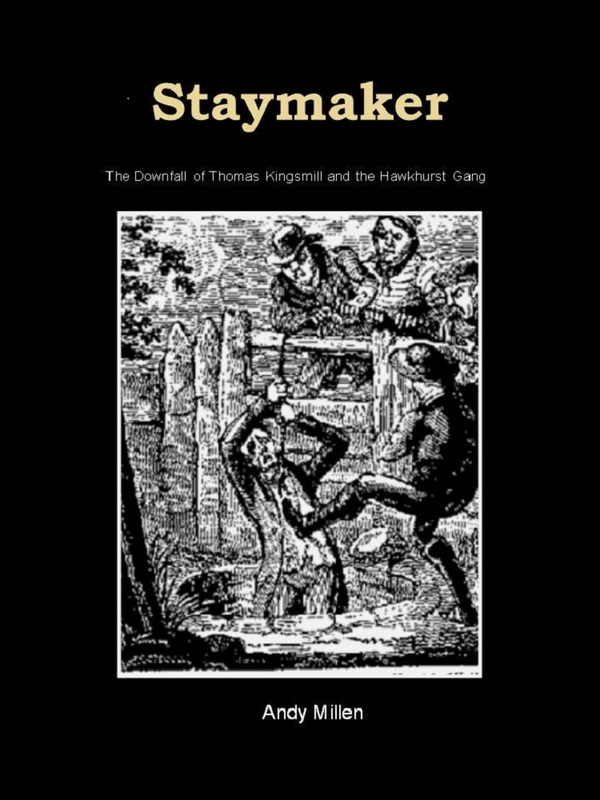 Buy Staymaker and read it for a thoroughly engrossing tale of the seedy underbelly of 18th century trade and familial wrenches through the gangs of the south east. You will, I’m sure, be transported back to an era of secretive signals and hidden trade. Nice one, Andy. I look forward to seeing what next bleeds from your quill.